So we all know how awesome hummus is on its own, no brainer right? But I’m learning that it can be even better when you start mixing it in with other ingredients. Case in point, Savory Basil Hummus Donuts. The time for making easy apps, swiggin’ cocktails and practising your best Dirty Dancing moves will soon be upon us. Obviously the cocktails precede the dancing but let’s start with the appetizers. Drinking on an empty stomach is not encouraged, trust me I have lots of experience. 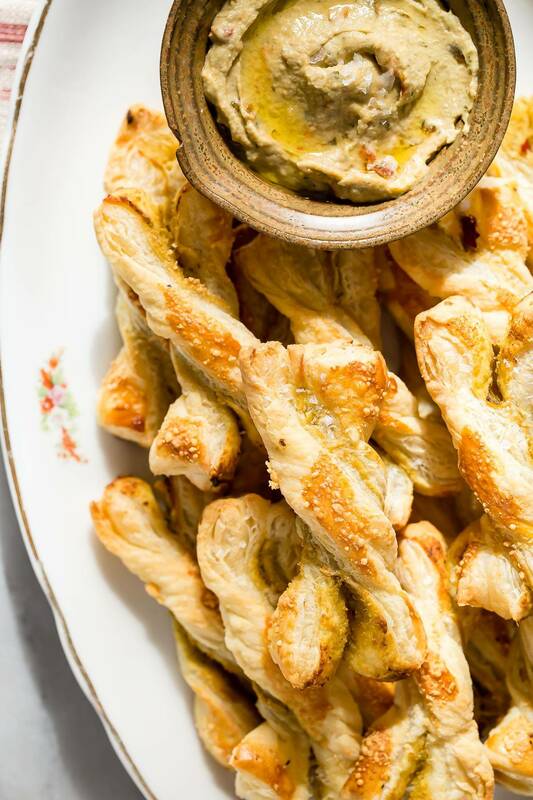 Take two sheets of puff pastry and sandwich them with your favorite Sabra Hummus, this is so easy I feel a little bad not giving you more, but sometimes simple is okay. Cut them into slices and twist like you’re on some kind of Origami baking kick. Each twist should be about 4 inches long. Brush each twist with some beaten egg and sprinkle with grated Parmesan, and that my friends is how you do easy warm apps. 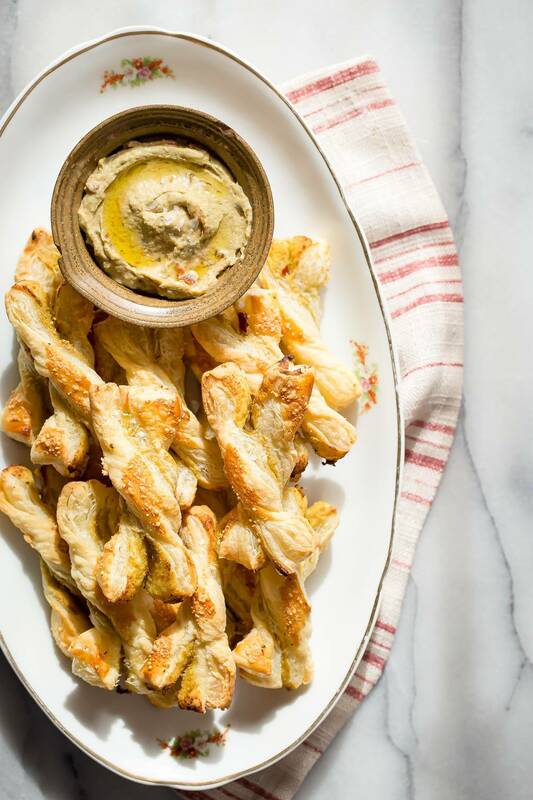 Serve warm with some hummus on the side and use these puff pastry twists to scoop up even more hummus, because hummus plus hummus equals happiness. This is a sponsored post for Sabra Hummus. All opinions are my own. An easy appetizer for the holidays. Puff pastry sandwiched with Sabra Hummus and baked until golden brown. 1 pack frozen puff pastry with 2 sheets thawed. 1/2 cup Sabra Artichoke and Spinach Hummus. Lay one of the pastry sheets on your work surface and spread with the hummus. Place the second pastry sheet on top of the first and gently press down to sandwich together. Slice the pastry in half vertically and then slice into thin strips about 1/2 inch wide. 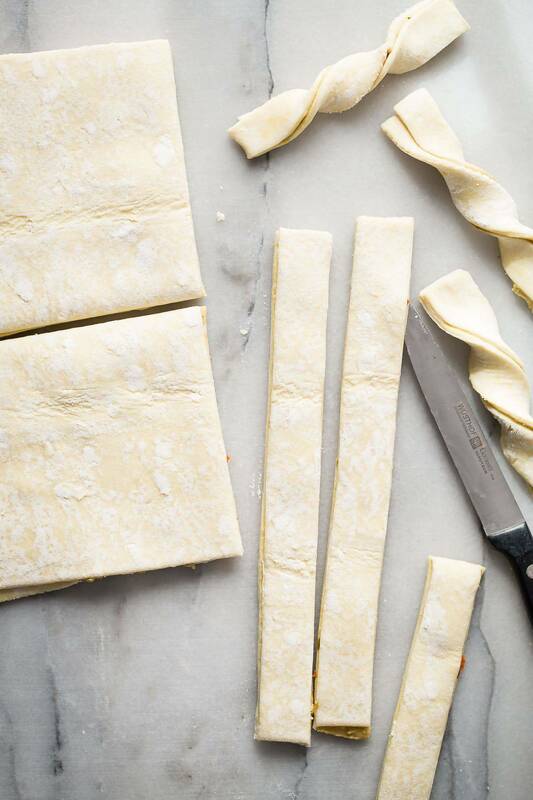 Take a strip of pastry and twist once. 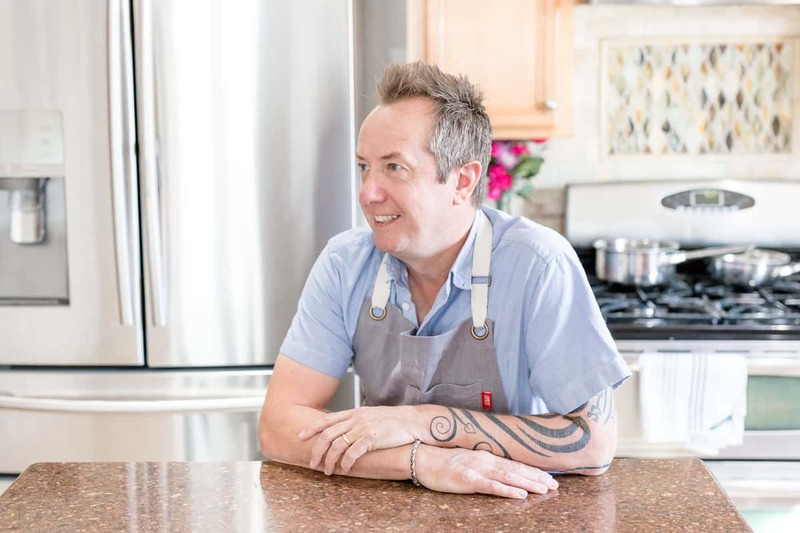 Place each twist on a baking tray lined with parchment paper. 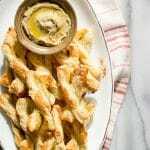 Brush each twist with some egg and sprinkle liberally with grated Parmesan. Serve warm with extra hummus on the side. I have always wanted to try making these! These twists are so simple yet elegant! I am woefully uncreative when it comes to my hummus consumption but my love for hummus knows no bounds, so this is definitely something I should try. The only thing about this – I would eat the whole platter all by myself – in one sitting! 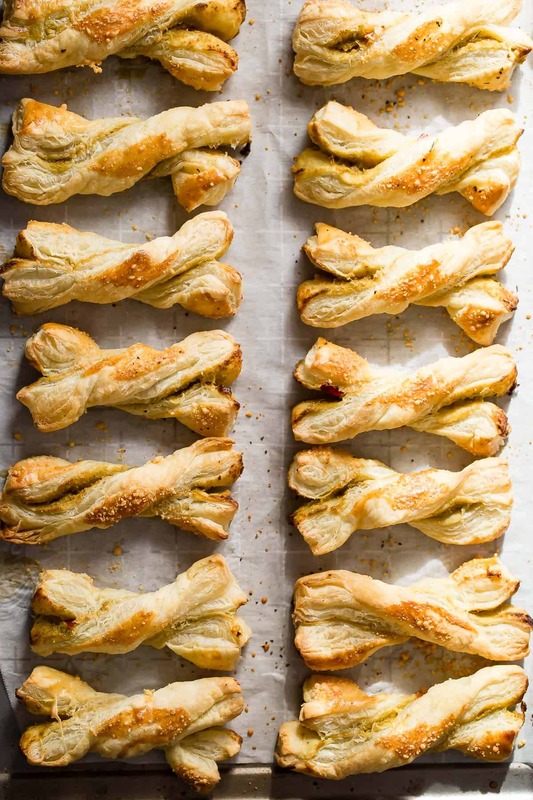 Pastry twists are my favorite! This is perfect for a party! Puff pastry AND hummus?! Yummy! These look amazing and the photos are absolutely gorgeous!! I would never have thought to combine hummus in a recipe like this! Absolutely brilliant, and the photos are seriously mouthwatering. Oh a new way to enjoy my hummus! Great idea! Love that you are adding hummus to savory pastries (also saw your doughnuts!). What a wonderful idea. I’d absolutely love to give these a try — your photos are beautiful too! Never apologize for bringing simple — it’s always best!! I love the shot of all the twists…pinning!